When come to Internet security, users especially those who are heavily reliant on it will never compromise and always look for solution to enhance their security system to avoid being the next victim of cyber crime. For better security measures, Google has recently rolled out an advanced sign-in security which requires users to have two-step verification before accessing their Google account. This 2-step or two-factor verification approach will provide Google users with better security compared to the single password protection of their system. Generally the 2-step verification introduced by Google requires another independent factor for authentication besides users’ password. It is much like what users might have experienced on some banking website where they need to enter their password plus a code obtained using their mobile phone or security token or dongle. The additional independent factor that Google uses is a single-use verification code that Google sends to users’ phone in one of three ways: using Google Authenticator app available for Android, iPhone, and BlackBerry; via SMS; or through a voice call (meaning users could even use a landline if they do not have a mobile phone). The setting up of this 2-step verification feature is not that complicated. 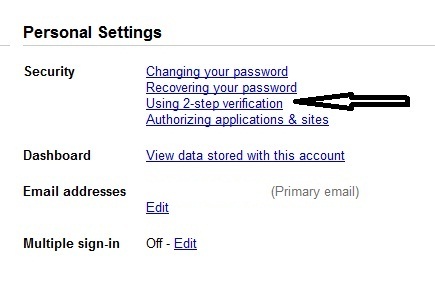 Users can proceed to their Account Setting Page, click on to “Using 2-step verification” under Personal Settings. Once users click on to “Using 2-step verification” link, they will be prompted with a user-friendly set-up wizard which will guide them through the whole activation process. Users will be guided on how to set up a backup phone and how to create backup code in case they lose access to their primary phone. Once this feature is activated, users will see an extra page that prompts them for a code when they intend to sign in to their Google account. Users will get a code via either one of the aforesaid methods from Google to proceed with the signing in. Some users might feel that the 2-step verification is tedious and troublesome. However, prevention is always better as you might suffer if you are the next victim of cyber crime.